Triangle Elara LN01A review | What Hi-Fi? Putting power in the hands of people can cause chaos, but thankfully, empowering speakers generally has the opposite effect. With built-in amplification, powered speakers eliminate the need for a separate amplifier and cable clutter, and take the effort of system matching out of your hands. There’s a move by some speaker brands to adapt their existing passive speakers and make active versions, and Triangle has no intention of bucking the trend with its Elara LN01A, having symbolically added an ‘A’ to the name of the budget LN01 bookshelves that they’re based on. The LN01As stand alone in Triangle’s wireless speaker offering, but the French brand will be hoping to continue its near-perfect track record of decent reviews. 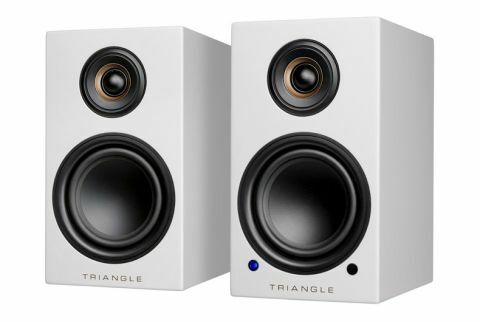 If the Wharfedale Diamond Active A1’s approach to powered speakers can be considered liberal in that both speakers are powered (wirelessly communicating to a separate connections hub), the Triangles could be labelled conservative. They pack everything – the Class D 50W-per-channel amplifier, power supply and digital and analogue connections – into the right speaker, connecting to the left passive speaker via a supplied 3m cable. That means a wire trailing between the two, but the saving grace is that only one needs plugging into the mains socket. There doesn’t have to be a cable trailing from the speaker to a source, as a built-in aptX Bluetooth receiver allows music to be streamed wirelessly from a smartphone, tablet or laptop. Sources can be hardwired through the analogue line-level and 3.5mm, and digital optical and coaxial, inputs. A subwoofer output also gives you the option to add extra brunt to the proceedings. More eyebrow-raising – and to Triangle’s credit, appealing – is that the line-level input can, like on the Roth VA4s (£200), double as a phono stage, allowing for a direct hook-up to a turntable. It’s a sensible inclusion playing into the hands of the current vinyl vogue, and one we soon hope becomes ubiquitous in the powered speaker market. While the aesthetic and engineering is very much aligned with the passive LN01s – they feature the same 13.5cm mid/bass driver, 25mm silk dome tweeter and compact, black or white piano lacquer-finished cabinets – the design of the right speaker has been appropriately manipulated to accommodate the extra functionality. In addition to the connection-heavy back panel, there’s also an LED on the bottom corner of the cabinet that indicates source selection (green for physical inputs, blue for Bluetooth). There’s a remote for adjusting input, volume and EQ, but the small, plastic and easily-lost handset is particularly unimpressive. Still, that’s not the case for sound quality – the LN01As’ performance only further sells them as a compelling just-add-source system, whatever source you choose. We begin with Bluetooth playback, and put on a CD-quality Tidal stream of Massive Attack’s Ritual Spirit. And like a WWE wrestler’s entrance theme tune, it allows the Elara LN01As to announce their bold and brazen character. Arrestingly solid, punchy and upfront at their core, the Triangles offer weight to the opening electric guitar, communicating the intense blow of bell strikes, and making a meal of the thumps and anchoring bass hum. As the building layers of instrumentation culminate in an African-drum pattern and vocal, it drives each rhythmic thread with controlled pace and punctuality – a credit to Triangle’s tuning of the amplifier to the speaker drivers. The treble can sound a little over-pronounced when the speakers are placed out the open, but back them close to a wall and it duly calms to offer a better balance – even if that, in turn, further emphasises a bass that already errs on the side of excess. Yes, for small speakers they can deliver quite the low-end clout. We test the DAC performance by playing Bon Iver’s 22, A Million album on the Marantz CD6006 CD player via the optical input, and the Elaras nail character consistency. They storm through 10Deathbreast’s pounding beat, delivering plenty of low-frequency willing reinforcing the bloated drone sound, and have the clarity and focus to ensure the distorted vocal and synths spark up. The presentation noticeably sheds solidity, clarity and openness through the phono stage, yet still keeps enough of all three (and a fourth: detail) to be deemed entertaining and thus worthwhile. With Jamie T’s Carry on the Grudge album, it still burrows deep for bass guitar plucks, and drives electric lines with power and texture. Though more solid and energetic than any rival we’ve heard, the Triangles are not quite the finished sonic article. They are outshone by the Audioengine HD6 Wirelesses when it comes to absolute transparency and finesse. Where the Elaras ensure Dandelion Wine by Gregory Alan Isakov and the Colorado Symphony sounds impressively substantial and imposing, the Audioengines retort with a more intimate, albeit restrained, rendition. They're more interested in flagging the subtle, aching inflections of his delivery, and the textures and low-level dynamics of instruments, than the power behind them. Mind you, a lack of soft touch doesn’t seem a huge blot on the Elara LN01A’s character when you consider their positives: the solid, confident and lively nature; the connectivity that goes the extra mile with a phono stage; and the subtle-yet-effective physical design. Ultimately, the Triangles are in good shape to satisfy anyone looking for a convenient, space-saving system solution that plays ball with almost any source.